We have managed to complete our first ten hours motoring so from now on we should be able to use the new engine as normal. 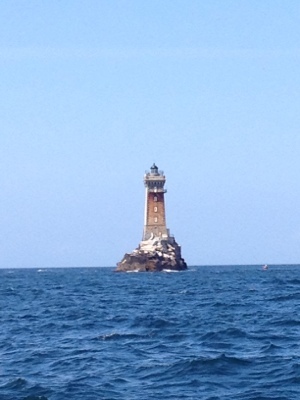 We went through the Raz de Sein at slack as planned with very little wind. We are now in a bay called Ste Evette, just outside Audierne. The wind generator and solar panels are charging the batteries nicely so maybe I will get to watch some of the footy later although it is a glorious evening. 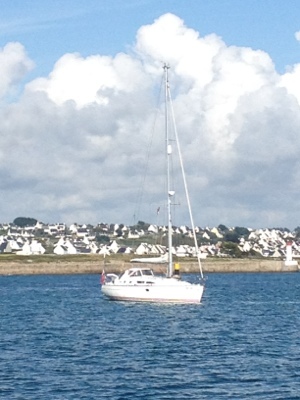 The photo also shows White Angel, another S&CA boat that is travelling part of the way south with us. Tomorrow we are hoping to go to the Iles des Glenan, an amazing archipelago of islands where the world famous French sailing school was set up after WWII. 3 Responses to As it should be…..
Glad to see you are on your way.We leave Spain on 10th August till 4th September.Shall we see you? We hope so but probably won’t know for a couple of weeks.